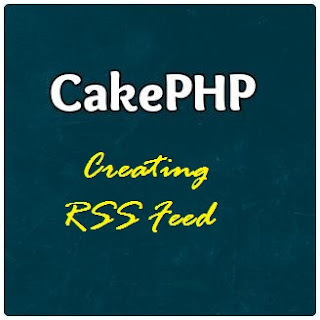 In this post we will learn how to create rss feed in cakephp.This is very easy tutorial to understand and implement.We are going to use cakephp simple blog tutorial here. Lets first setup our database for the posts.Simply run the following SQL query into your database. Here note the use of set.It will pass the data that we get from the find(all) method to the view(we will create next) file.we can access the data of find(all) method using variable '$posts' in the view file. Now go to http://yoursite/posts/index or http://yoursite/posts and you can see the list of the posts. The method Router::parseExtensions() accepts any number of extensions.Using extensions, we can create different versions of the same view. (3) Now made some changes in the index function of the Post Controller. (4) Now create a new folder named "rss" in app/Views/Posts folder and create a file called index.ctp with the following contents in that folder. (5) Create a link in posts listing page.Edit index.ctp file in app/Views/Posts folder.Add the following line in it. Now browse to http://yoursite/posts, you will see a listing of posts with a link titled Feed.